Excellent combination of arginine, ornithine, and lysine at a ratio of 2: 1: 1 helps in getting much better results, thanks to their effects on the endocrine system. It is completely safe for health (without doping) way to normalize growth hormone. Highest quality! Growth hormone is a protein with a complex structure, it builds up to 191 amino acids and is synthesized in the pituitary gland. It is thanks to him that the body is growing rapidly in adolescence. It is referred to as "good hormone" because of its properties (including the impact on the reduction of body fat). 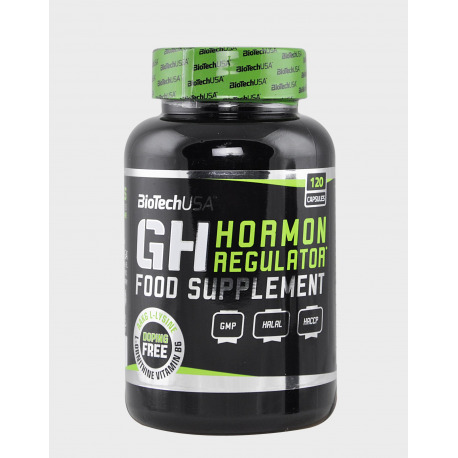 Biotech Mug GH hormone regulator is based primarily on the alpha-ketoglutarates L-arginine (AAKG and ornithine hydrochloride which are sources of amino acids L-arginine and L-ornithine respectively, in relation 2: 1. In addition, the formula has been reinforced with lysine and witaminęB6 that It helps reduce fatigue, but also helps regulate hormonal activity in the body. you can not forget about its impact on the proper metabolism. BIOTECH MUG GH HORMONE REGULATOR - SUPPLEMENT TO MEASURE THE XXI CENTURY! 4 capsules daily before bedtime. Ingredients: alpha-ketoglutarate of L-arginine; chlorowodorekL-ornithine; capsule [gelatin, pigments (titanium dioxide, iron oxides and hydroxides)]; L-lysine; anti-caking agents (silicon dioxide, sodium carboxymethyl cellulose); pyridoxine hydrochloride. The product is manufactured at the plant processing food containing milk, soy, egg and mustard (mustard).